These days, people with kidney failure can opt for home dialysis rather than make trips to centres. This is made possible with the use of peritoneal dialysis, which can be done with the use of a machine. For many, such an arrangement offers flexibility and enables them to, for instance, go back to work. Besides, home dialysis does not require needles and, because it causes less strain on the heart, less medication is also needed to control one's blood pressure and anaemia. However, taking charge of one's own dialysis can spark anxiety in some people, especially those who are new to or lack confidence in carrying out what is a very important health procedure. "It is understandable that many first-timers are often very nervous at the prospect of home dialysis," said Ms Sangeeta Kaur, nursing trainer for peritoneal dialysis and respite nurse at Active Global. For those who are new to to the procedures, she added, "there is always the fear of missing a step or doing it incorrectly. With inexperience also comes the fear of infection and not knowing when to seek medical help should issues arise". There are two types of dialysis that can be done at home: continuous ambulatory peritoneal dialysis (CAPD) and automated peritoneal dialysis (APD). CAPD involves manually exchanging dialysis fluids four times a day, said Ms Sangeeta. A bag of dialysate - a solution of water, minerals and the sugar dextrose - will be attached to the patient's body with a catheter. The fluid gets filled into the abdomen and pulls wastes and extra fluid from one's blood. Here, the inside lining of one's own belly, or peritoneum, acts as a natural filter. The solution is drained out after three or four hours, and a new bag of dialysate is attached. Each draining takes 20 to 30 minutes. The second type of peritoneal dialysis, APD, uses a machine known as a cycler to perform the fluid exchange overnight. The bags of dialysis solution are hung next to the bed and connected to the cycler machine which, in turn, is attached to the patient. The cycler would perform three to five fluid exchanges, usually for eight to 10 hours, while the patient sleeps. In comparison, the treatment that patients get at dialysis centres - known as haemodialysis - involves being hooked up to a machine that filters the person's blood. This takes up to four hours each time, and one usually has to go to the centre three times a week. Generally, patients who opted for home dialysis reported feeling "better and less washed out, sleep better and have more energy for daily tasks", observed Ms Sangeeta. For those who remain apprehensive, they may consider hiring a nurse who is trained in the procedure to make home visits. 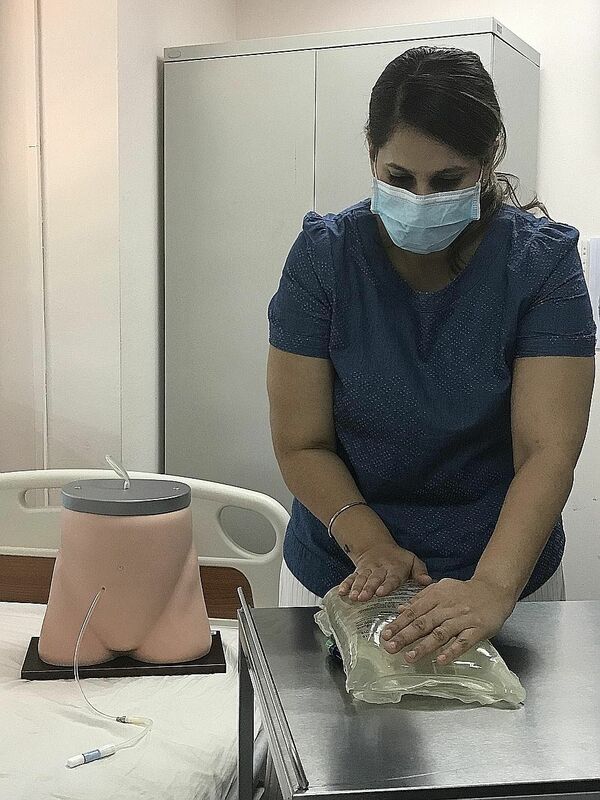 "They can either do the procedure for the patient at home, or help familiarise them or their family members with it, so that they can eventually assume control of their own treatment," said Ms Sangeeta. It is also possible to arrange for live-in caregivers who are trained in dialysis. This may help patients who require long-term assistance. Ms Sangeeta shares four things to look out for when performing dialysis at home. •Measurement of vitals: The patient's weight and blood pressure need to be monitored regularly. One also needs to watch out for any unusual reactions, such as swelling of the lower limbs. •A clean environment: One needs to keep a clean area for treatment. This includes wiping down all surfaces, closing windows to keep out the dust, and switching off the air-conditioning and fans during the treatment. •Infection control: Scrubbing the hands and wrists with antibacterial soap and warm water is an important first step. Special care must be taken to clean the area of the body where the catheter is attached. Both patient and the person helping to carry out the procedure should don surgical masks. •Keeping all supplies sterile: Check that none of the packaging is torn and open medical supplies only as and when ready to be used.